A Huge Weekend Of Giveaways. Giveaway 1 from Stuck On You. | Life Love and Hiccups: A Huge Weekend Of Giveaways. Giveaway 1 from Stuck On You. A Huge Weekend Of Giveaways. Giveaway 1 from Stuck On You. Pin It Well hi there. I hope you are having the most fabulous weekend - whatever you may be doing and however the weather is behaving where you are. As you may or may not know, last weekend was my birthday and I was spoiled beyond rotten. There is only one thing I love more than being spoiled rotten, and that is having the chance to spoil others. This weekend I have the most amazing line up of giveaways for you guys, cause let's face it - you deserve it. All weekend at random times, posts will be going up for a new giveaway. The giveaways will run until next Sunday night 24/06/12 7pm AEST when I will draw the winners using Random Org. The only catch I'm sorry is that these giveaways are limited to Australian residents only. A huge sorry to our overseas friends. Hopefully, this little old blog will become known overseas and sooner rather than later I can offer some great prizes for you guys too. So let's get this party started. Ideally I would cue some really cool music to get us all in the mood, but I'm so not going to - not cause I'm a spoil sport or anything, more I am just busting to introduce the first giveaway. So without further adieu - Giveaway Number 1. Stuck on You Personalised labels and gifts have the most gorgeous range of products that you can have personalised with your child's name. Originally starting out over 16 years ago supplying gorgeous kids labels, for bags, clothes, books and pretty much everything, Stuck On You now sell personalised clothes, Bags, Stationary, Wall decals, party invitations and stationery, puzzles and loads more. These Pjs's my little guy Sam is wearing have been personalised with his name on them and he was one happeeeee little guy when the parcel arrived for him. I have washed PJs these no less than 5 times in the two weeks he has had them as he will not wear anything else to bed now. They wash and dry brilliantly without any fading to the colours or designs. As you may know Stuck On You are one of my newest sponsors and I am so excited they offering you guys two fabulous giveaways this weekend. 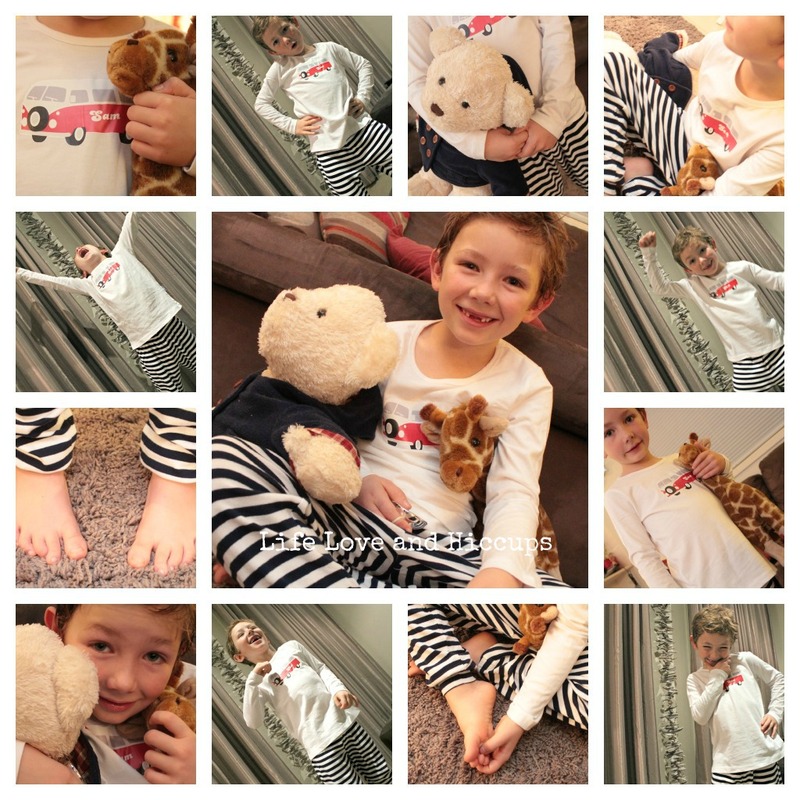 The first giveaway is for a pair of their gorgeous PJs, personalised for your child's name. These long sleeve and pants set are perfect to snuggle up in for winter. 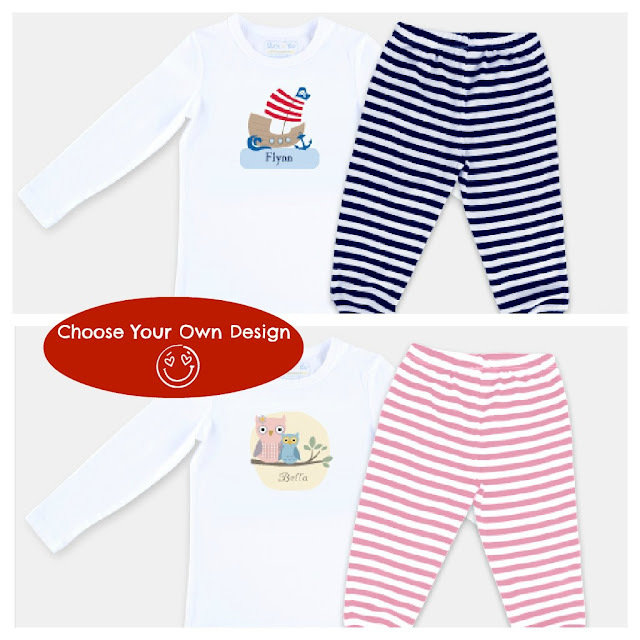 They come in Navy and White stripe or Pink and White stripe and their 42 adorable designs you can choose from. They are valued at $39.95 and come in sizes 2, 4 and 6. One winner will win a pair of PJs personalised for one lucky child and you get to choose your own design. You can check all the sweet designs here. There will be another fabulous giveaway from Stuck On You later this weekend, but for now, here's how you can enter to win this one. If you simply can't wait to see if you win, dont! You can go to the Stuck On You and order any of their gorgeous products now. Sonia, these are ridiculously cute. I really don't know which child to choose. lol. I might have to buy another pair if I win, so I don't have to pick a fave out of my two!! Congratulations Emily. Please send me an email to lifelovehiccups@optusnet.com.au with your contact details, so we can organise your prize for you.